This game was purchased years ago as a converted Zaxxon. I had thought to restore it, returning it to Zaxxon. moved to it's new home in Florida for more storage. This game was far down on the list of projects. It's time has finally come. After making a decision on another conversion game to turn it into a horizontal multigame Plus. This game by default became the vertical multigame Plus. two cabinets put together. The bottom, the beginnings of a table game and then a top "cap" of an upright. it other than under that slide out tray. This area is great for use as a Multigame Plus. The "PLUS" part of this change is to add a switcher in addition to a 60 in 1 jamma board. The only thing needed to make use of that space was to cut a hole in the back to access that area. First, everything I have done to the cabinet can be easily reversed. So, a future owner can restore the game to a dedicated Zaxxon if desired. I even have a complete original Zaxxon CP and board I had gotten for that purpose before making this change. The cabinet was first cleaned to remove the 30+ years of smoke and decal glue and touched up. The game board tray was removed, all components on it were removed and cleaned. The tray itself was cleaned and sanded. 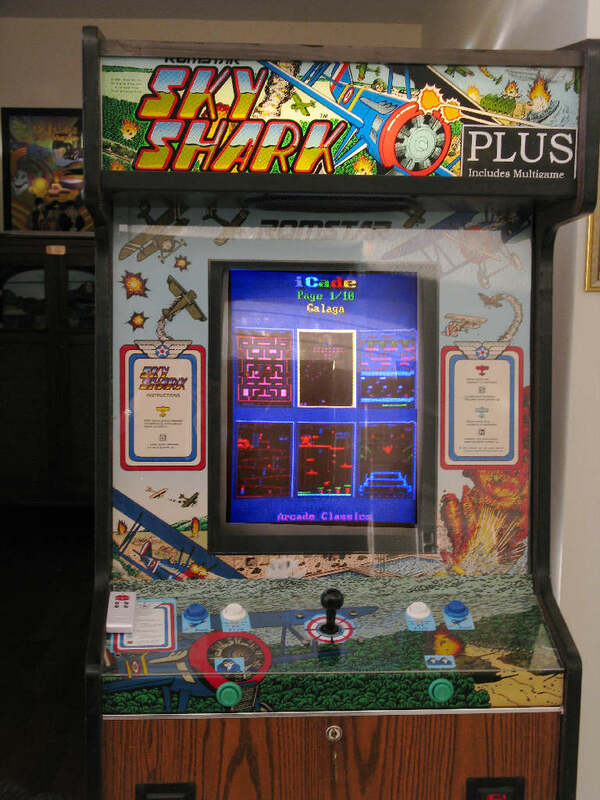 Finally everything was put back, except the Skyshark game board. The original Zaxxon power supply is intact. It actually was used to power the Skyshark before this change. 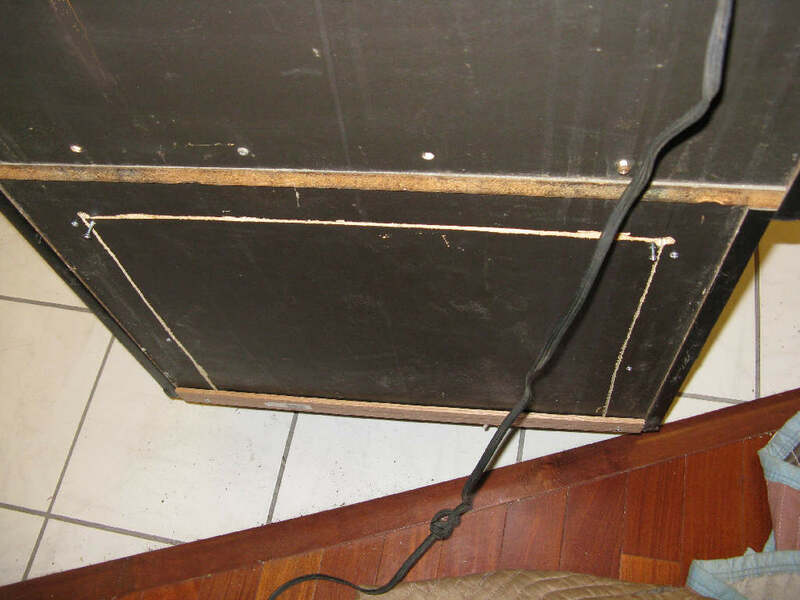 Now the only part of it used is the isolation part of the power transformer. All the original connectors and wiring harness is still in the game. 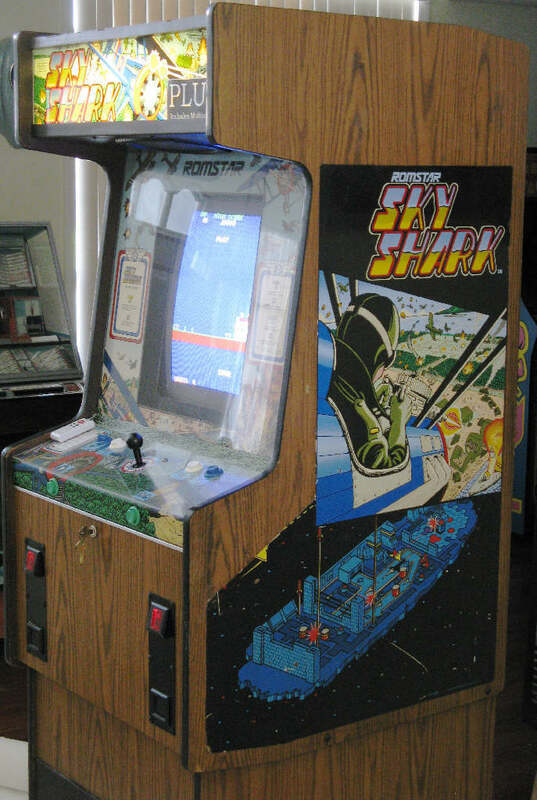 The original end connectors had been removed on some harnesses to connect the Skyshark Jamma game to the cabinet. 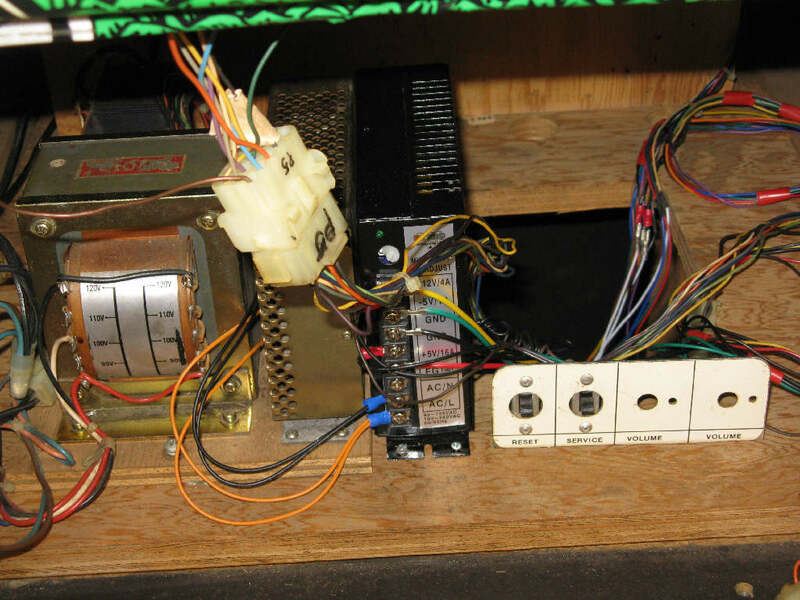 Those original harnesses were adapted for a separate Jamma setup including a new switching power supply capable of running any board set. The front door harness was incorporated, along with video, svc, test sw's and audio output. 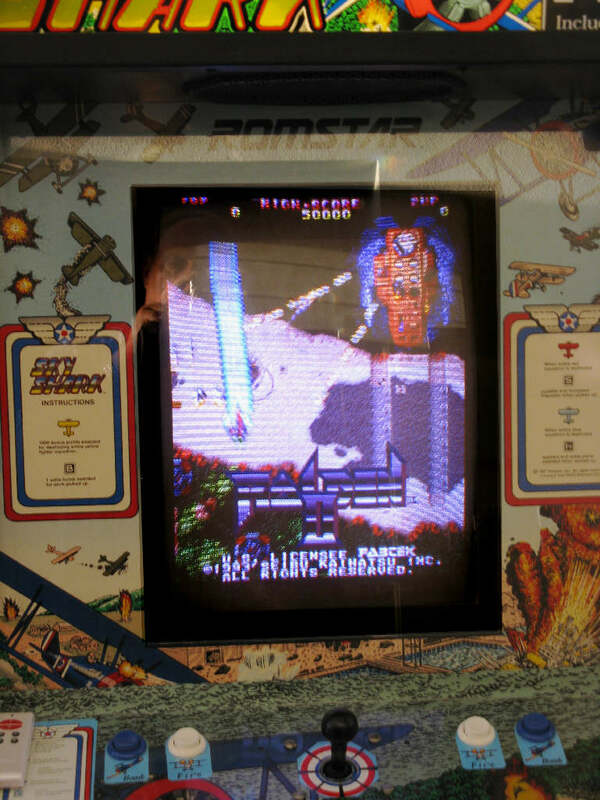 The result is a game that can accept 6 vertical jamma game boards and select between them. The final layout of the space has not been finalized. Note: there is still space on the tray where the original Zaxxon board set was located. Below are some photos of the almost completed game. 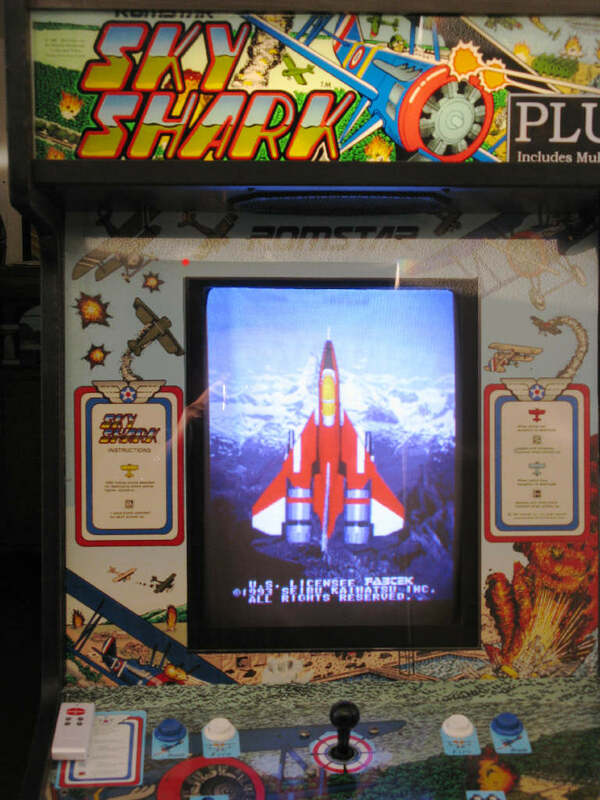 When they changed the game to Skyshark, they just put the new art over the original art, removing the top of the Zaxxon art. Making it very easy to determine what the game it originally was at a glance. trying to remove it, plus when next to other games the lower part would not have been seen. I decided to leave it as it is.....a reminder of it's history. Except I removed the old glue still there after all these years! to allow the volume of games to be altered from this control. The 60 in 1 needs this option badly. that was in the cabinet when it was found. The board on the right is the switcher, with RadenII facing you. 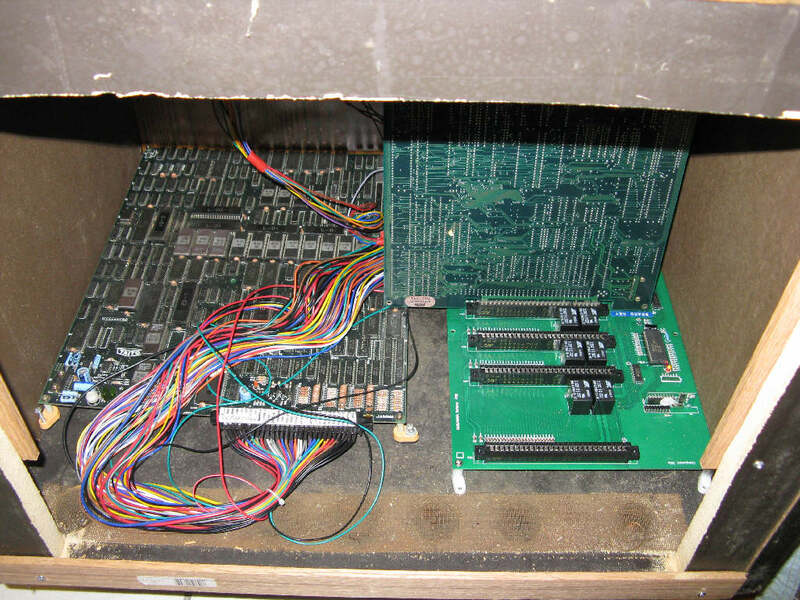 Unseen in front of RadenII is the 60 in 1 Multigame Jamma board. The Skyshark is connected to the switcher using a jamma extension cable. Some ties need to be added. I haven't decided on the final placement of boards yet. 4 sides of this box are available 3 sides and the bottom. The discoloration on the front is from the sun streaming in.